38 South Sudanese students were arrested after they staged a protest in front of their embassy in the Ethiopian capital, Addis Ababa over delayed allowances. Dut Makur Mapur, a representative of the students claimed their acting ambassador, Darious Garang ordered for their arrest. The affected students were from the universities of Mekelle, Bardar, Jimma, Awasa and Technical Vocational Training Institute (TVET). "There are two groups of students from South Sudan to Ethiopia, the first group was from 2012/ 2013 comprising of 23 students doing different departments in Mekelle university and the second group from 2014/ 2015 comprising of some students to Bardar, Jimma, Mekelle and Awasa universities and the target group is in technical vocational training institute known as TVET," said Dut. The students are entitled to $100 monthly and a round ticket at the end of the academic year from South Sudan government. "Up to now, we have almost four years without receiving our stipend, the same is true for the second group. They haven’t received [their stipend] for two and half years," stressed Dut. 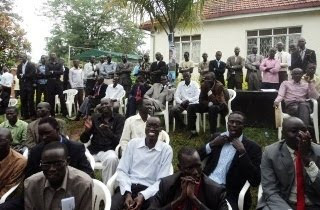 The students’ representative called on South Sudan government to instruct its acting ambassador to avoid mistreating them over their rights. “I condemned that act and I urge immediate release and solution to their problems. I call upon the government to act wisely and instruct ambassador Darious Garang to get a better solution," said Dut.